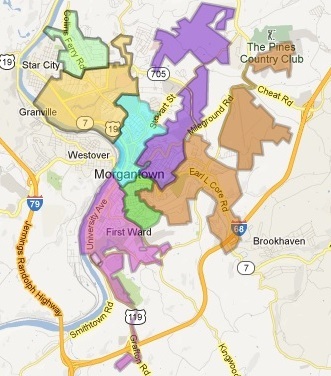 The map of the city of Morgantown, West Virginia looks like a block of swiss cheese half-eaten by a pack of rats. So too the city’s budget, the city’s services, and the city’s infrastructure. It’s as if half the city has been clawed and gouged by varmints. Look at it. Look at the map. Look at the streets. Look at the neighborhoods. Look at the public spaces. Not all, of course, but a lot. Then look again at the map. See those light spaces around 705 and Mileground Road and Cheat Road and Greenbag Road (between First Ward and Earl Core Road)? All those spaces are loaded with business and commerce that pay no B&O (Business & Occupation) tax to the city – unlike every other city business (those located within the darker colored sectors, the city itself). So this is how the city is gutted – in fact the whole area – fiscally, and socially, and physically. Businesses in the city pay B&O taxes to help support the city that helps to support them. But businesses technically located “outside” the city pay no B&O taxes even though those businesses would not exist if not for the city. It’s wrong. It causes the city to suffer. It hurts the city residents and the city workers. And thus the people of the county suffer, and the students and employees of WVU. While much of the city of Morgantown is nice enough, providing a good place to live for many, the lousy roads, the crumbling or non-existent sidewalks, the pollution and traffic menace (not least by heavy trucks), the lack of high quality public schools, the badly underdeveloped parks system and public spaces, the dire lack of housing and services for the homeless, the endless rows of slum housing for WVU students, the trash, the fights, the fires – the perennial lack of funds for pressing social needs, employment needs, and quality of life – is outrageous. How pathetic is the city of Morgantown? So pathetic it had to beg Monongalia County for half a million dollars in a loan to build an access road to the forthcoming light industrial park by the airport. How pathetic is the city of Morgantown? So pathetic it could barely agree to buy the great public space that is the old Woodburn schoolgrounds, having to scramble to find less than half a million dollars to be paid out at a mere $70,000 annually over seven years to the county school system. And so pathetic that is lacks funds to even marginally let alone fully develop that great public space and many others. How pathetic is the city of Morgantown? So pathetic that it has stated is has no money this summer for paving the crumbled city roads. How pathetic is the city of Morgantown? So pathetic that is has virtually nothing new to offer this year toward the city’s perennial problem of homelessness. How pathetic is the city of Morgantown? So pathetic in regard to power lines, like the state, that is has no money or leadership to bury the power lines that make the city streets look so ghastly, no money or leadership to get rid of the telephone poles that narrow sidewalks, menace pedestrians, especially those with disabilities, no money or leadership to bury these lines and get rid of these poles that are constantly subject to storm damages and power outages because they are not buried. Pathetically, we the people of Morgantown have failed to take the one most obvious and most effective step to remediate these problems and more. The obvious necessary, and proper, step is annexation. Morgantown must annex the pockets of land and commerce that miraculously fall outside the city’s current boundaries. These are business-heavy areas that ought to be paying B&O taxes to the city. These businesses benefit mightily by their proximity to the city. Virtually surrounded as county islands within the city, these swaths of business enjoy high visibility and direct access to the many city residents and city workers and city amenities and consequent continuous flow of city money and city support. Yet none of these businesses reciprocate with any B&O taxes to the city, being technically located, in county pockets and islands, beyond the city boundaries though virtually wrapped within the city boundaries. See the map. See the commercial sectors along WV 705, and Greenbag Road, and Hartman Run Road, and the Mileground, and US 119 out to Glenmark Center and to Pierpont Landing. The businesses in these areas make their money directly and indirectly off of Morgantown city residents and Morgantown city workers and Morgantown city infrastructure and Morgantown city services, which are supported by city funds. The city funds consist largely of B&O taxes. Thus these non-city businesses, which also create additional traffic and pollution and other problems for the city, and which operate in such close proximity to the city, should pay B&O taxes, which will only occur if they are incorporated into the city. These many businesses are essentially an indivisible part of the city, yet they have not formally been made part of the city, and thus do not pay their fair share. They do not pay what current city businesses pay, and they will never contribute as they should until the city of Morgantown properly fleshes out its boundaries by annexation – to both interstates, and beyond. Annexation, by providing the additional B&O taxes, would solve a lot of city problems and quality of life issues, and many other problems could be remediated. This annexation should have happened decades ago. The Morgantown City Council continues to offer no leadership on this most pressing of issues, and the people of Morgantown have not remotely sufficiently pressured the Council to get it done. The city deserves better. The county would benefit as well. So would WVU. The need is very great. The rewards would be great. The city must increase its pathetic revenue stream by long delayed annexation to address its long neglected needs. The City of Westover is far ahead of the City of Morgantown in properly pressing for the long overdue and badly needed annexation of the mall and other commercial operations in immediate proximity to that city.